The word Breathalyzer might spark a few heart palpitations, but forget the police for a moment and consider the benefits of being able to quickly check your blood alcohol level even before you leave a bar. Shaun Masavage, a 26-year-old electrical engineer has applied his expertise to creating DrinkMate, an incredibly accurate, small Breathalyzer-type that you can power via the USB port on your phone. How small is it? 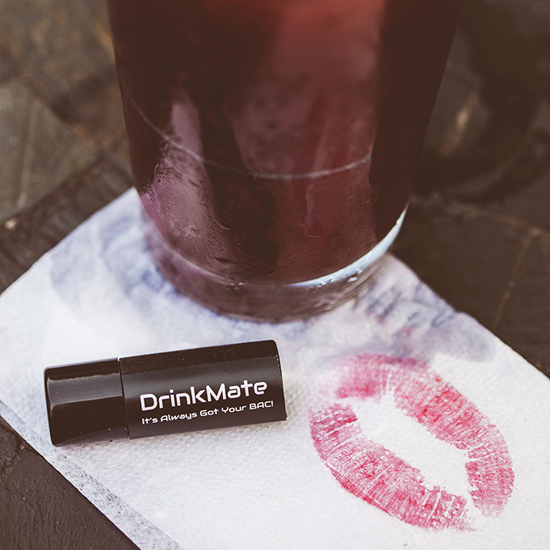 The DrinkMate is 30 percent smaller than a ChapStick and weighs just 0.2 ounce. DrinkMate is already fully funded on Kickstarter with more than two weeks to go. Once manufactured, this tiny device may be the key to derailing some dismaying statistics: According to the justice department there were over 1.1 million DUI arrests in 2013 alone. Here, we chat with Masavage about his promising invention, circuitry and Saturday nights. 1. What made you want to take on the Breathalyzer? I’ve been fascinated with gadgets since I was a kid. I was always fiddling around with various ideas, and one day I stumbled across these alcohol sensors. I thought they were way too expensive and I didn’t understand why. When I dug in and did some research, I also discovered that a tremendous amount of DUIs are given out every day. It’s actually quite disturbing. 2. How does DrinkMate work? First, it’s powered using USB hosting that enables devices to get power from another source, unlike our competitors, which require batteries. The air filter that a user blows into has been designed to take a greater range of breath speed, and then to direct it over the semiconductor-based sensor so that readings are precise and repeatable. What’s new with DrinkMate is that we’re creating an algorithm that will adjust and account for the sensor aging, so no recalibration is needed. 3. How long have you been working on DrinkMate? It’s been about two years, which could have been cut back if I had more time to focus on it. Some of the aspects of the hardware needed many consecutive hours to work on, like the circuitry. Right now the team is small, it’s just Mack Redding, who is handling the app design, and myself, and we have plans to bring in a data scientist. 4. So what’s your day job? For three years I worked at a large defense contractor, but it was moving in a direction I didn’t want to go in. DrinkMate was finally becoming a reality, and I realized I needed a job that I didn’t take home at night. Now I’m a financial analyst for ADS Corporation, supporting the Office of Naval Research. It’s close to where I live, and it gives me the mental sanity to work nights and weekends on DrinkMate, in my living room! 5. DrinkMate works only on Android phones. Why? Well, my expertise is in Android development. With Apple there are many, many expensive fees involved in their app development, you have to sign NDAs and they just make it very difficult for developers. Have you ever seen an inexpensive Apple gadget? There’s a competitor, the Breathometer, which is iPhone only, and twice as expensive as DrinkMate. They’ve promised an Android version, but have yet to release it. 6. If a user has consumed any amount of alcohol, DrinkMate recommends not driving. Why did you include that feature? It’s mostly for liability reasons. There’s not a single Breathalyzer that will tell people to drive. Our philosophy is that you should separate the two actions, you’re either drinking or you’re driving, but never both. By making DrinkMate more accessible and cheaper ($25), we’re hoping users will use it publicly, and that it will take away some of the stigma of checking on your BAC [blood alcohol concentration]. 7. On Saturday nights, do you carry a DrinkMate in your pocket? I purposely do not take it out with me because I’ll go into engineering mode and make sure everyone is using it properly. But I do take it out specifically for endurance testing.